Drain out all the liquid from your canned peaches. Add in your peaches, orange extract, caster sugar, and mango smoothie(or liqueur of your choice) into a blender and puree until smooth. Pour your peach puree into a large bowl and set aside. Add the gelatin into the boiling water and stir until completely dissolved. Set aside and allow to cool slightly and then add it into your peach puree. Stir to combine. Also add in two drops of gel food coloring. I didn't film that part, but it's important you add it in to retain that pretty peachy color. Beat your egg whites until stiff. Set aside. Beat your heavy whipping cream in a well chilled bowl until stiff. 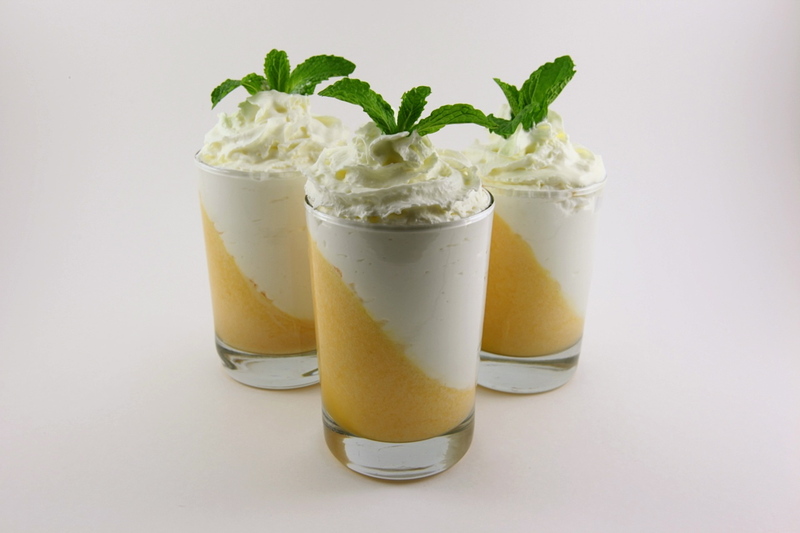 Using a balloon wire whisk, start off by taking some whipped cream and folding it into your peach puree. Once combined, take a little bit of your egg whites and fold it in gently as well. Interchange the two and repeat the process a few more times. Next take your shooter glasses and place them at an angle on your egg carton. Place your egg carton on a large baking sheet...it makes transferring your mousse into the fridge a lot easier. Put your mousse into something with a spout, and then gently pour until the mousse reaches the top of the rim. Repeat with the rest of the glasses. Once all filled, move them into fridge and allow to set overnight. Take some mini martini glasses, wet the rim very well with some water, and swirl the glasses in some orange or yellow sprinkles. Pour in your mousse half way up the glass. Once done, place into the fridge as well. Once the mousse has set make your whipped cream topping. Add heavy cream into well chilled bowl and beat until soft peaks. Add in your vanilla extract and powdered sugar and beat until stiff. Place some whipped cream(reserve the rest) into a disposable piping bag or ziplock baggy and cut about 1/4 inch or so off of the tip. Pipe the whipped cream into the shooter glasses just until you hit the rim. Using a different piping bag, fitted with a star cake tip, pipe the tops, using a circular motion, just as you would when frosting a cupcake. Garnish with mint and refrigerate until ready to serve! If using mini martini glasses--first add a dollop of whipped cream and then flatten it out. Then top with whipped cream using the star tip just as described above. Garnish with mint leaves. Refrigerate until ready to be served!